The Chinese bride is dressed in red, as the colour is not only considered powerful and auspicious, but also believed to drive evil spirits away. Traditionally, brides from Northern China wore a one-piece Qipao, while their southern Chinese counterparts wore Hong Kua or Qun Kua. Dresses are elaborately embroidered with symbols of the dragon and phoenix, to symbolise the male and female respectively. The bride may also choose to wear the "phoenix crown", an intricately designed, traditional head-dress adorned with gold, silver, feathers and pearls. A red veil is also worn over the face as she makes her departure from her family’s home to that of her husband. In contemporary times, the groom’s dress typically consists of a mandarin-collared jacket, or Ma Kua, with embroidered dragon or double happiness motifs. The double happiness symbol "囍", is composed of two standard Chinese "喜" characters used as a symbol of blessing and happiness for the newlyweds, as they embark on the journey to spend the rest of their lives together. Guo Da Li can be translated as the “Grand Gift Ceremony”, and marks an important formal meeting between the parents of both the bride and groom. The event takes place two to four weeks before the wedding day. On this occasion, the parents of both the bride and groom pick an auspicious date for the wedding ceremony. The groom’s family then presents various gifts that represent fertility and prosperity to the bride’s family. Ideally, all gifts should come in even numbers as this represents “good fortune” in the Chinese culture. After this ceremony, the bride and groom are considered officially engaged. For Hakka and Cantonese ceremonial necessities, click here. 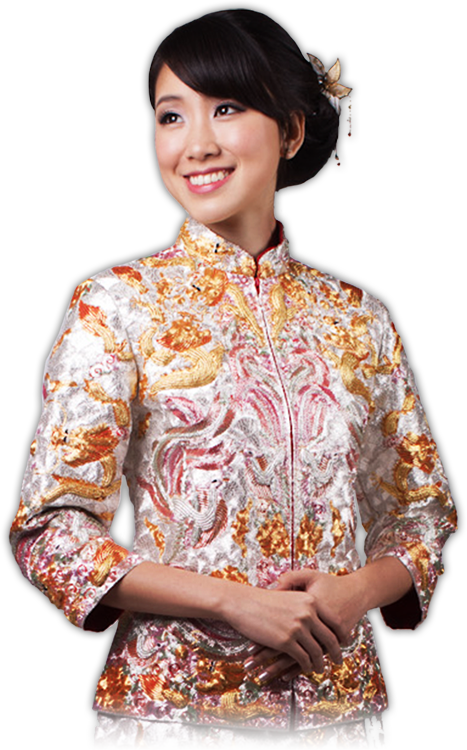 For Teochew and Hokkien ceremonial necessities, click here. Jia Zhuang refers to the dowry presented by the bride’s parents to the groom’s family after the Guo Da Li and at least one day before the wedding day. It symbolises the wealth and status of the bride’s family. 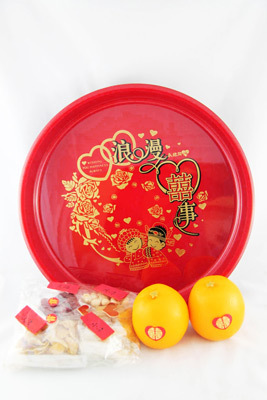 The Tan Tong (痰桶), a 4-piece or 5-piece gift set comprising a mug, a saucer, a basin, a bath basin and a potty, placed together with oranges, longans, sugar and dried dates. 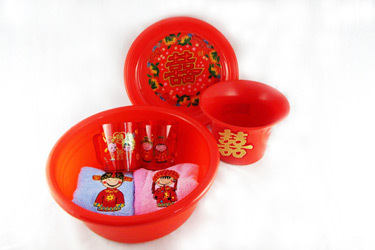 This is gift set is believed to bless the couple with children and grandchildren. A red ruler to symbolise “fertility” in Chinese culture in terms of both wealth and offspring. Red bed linen, which is believed to keep the couple in love and drive away bad luck. A pair of shoes to represents the couple aging gracefully together. "Happiness sugar", to represent sweetness in marriage. 2 bowls with dragon and phoenix motifs, and 2 sets of chopsticks, to be used by the couple to eat dessert on their new bed on the wedding day. After the dowry is sent to the groom’s family or the couple’s new home, the groom’s family invites a respected female relative or friend to "set the bridal bed" at the new home. This is known as An Chuang, and the event takes place between one week and three days before the wedding day. Traditionally, a young boy will also sleep on the bridal bed the eve of the wedding day. This is believed to bring the blessing of fertility to the newlyweds. The Shang Tou, or “hair dressing” ritual, is usually performed on the bride the night before the wedding by a female friend or relative whose husband, parents and children are all still living. The ritual takes place after the bride has bathed in water infused with pomegranate leaves, and put on new pyjamas and slippers. While dressing the bride’s hair, auspicious words are recited and the bride’s hair is tied into a bun, in line with the hair style of married women in Chinese tradition. This ritual also represents the bride entering into a new chapter of life. Ying Qin refers to the traditional practice whereby the groom arrives early in the morning of the wedding with his team of best men to the bride’s home. Sisters and female friends of the bride then design a series of challenges that the groom and his team of best men have to overcome in order for the groom to access the bride in her bedroom. Such challenges may include having to answer questions about the bride, or having the groom make a 'love oath' to his bride. The groom will also need to hand out red packets to the bride’s sisters and friends before he is granted access to his bride. Chu Men refers to the bride’s departure from her family home after Ying Qin. As the bride and groom walk out of the bride’s home to the bridal car, the bride’s sisters and friends throw rice and red beans while the bridesmaid shields the bride with a red umbrella. The bride is also accompanied to the groom’s home only by single females. Guo Men refers to the bride’s entry into the groom’s family, and is symbolised by her entry into the groom’s house with the bridal entourage. At the groom’s home, the bride and groom serve tea to the groom’s parents and other elders as a gesture of respect. Lunch is then served to all, and usually consists of 9 dishes. 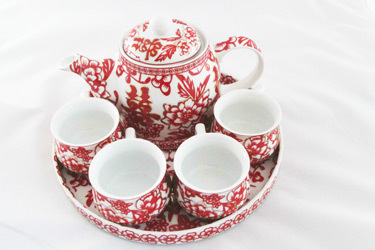 Tea is significant in Chinese wedding ceremonies as it symbolises respect. The tea ceremony is the occasion where the bride is formally introduced to members of the groom’s family. When serving tea to the elders, the bride stands on the right of the groom. They then kneel to serve tea. Those being served are seated and served in order of seniority starting with the groom’s parents, followed by the eldest members of the family. After drinking the tea, they present the bride and groom with gifts in the form of red packets or gold jewellery. The tea should be brewed with longan and red dates to symbolise sweetness and blessing for the couple to conceive early in marriage. San Zhao Hui Men refers to the bride’s home visit, traditionally taking place 3 days after the wedding ceremony. The bride’s younger brother travels to the groom’s home in the bridal car with a basket of gifts for the groom’s family. The groom then welcomes him by opening the car door for him. San Zhao Hui Men is significant as it is the couple’s first visit to the bride’s family home as a married couple. The couple comes prepared with gifts for all elders of the family. In contemporary times, all the events of the Chinese wedding are compressed into a single day. To symbolise the passing of three days, the bride changes out of her western style wedding gown into her Qun Kua. Red packets are also used to replace gifts for family elders. With this, the modern Chinese wedding ceremony is complete. Copyright © 2014 House of Etiquette. All rights reserved.